Former ONE Lightweight World Champion, Shinya “Tobikan Judan” Aoki has revealed that he harbors many fears, especially when he competes. Aoki previously mentioned that one of his greatest fears is the fear of failure. But knowing he has fans who look up to him, he puts on his game face every time he competes. 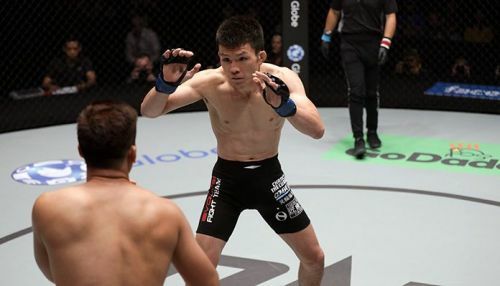 Aoki becomes a different man every time he enters the cage, he zones out and is focused solely on his opponent for the duration of the match. Being a former World Champion, all eyes seem to fall on Aoki each time he performs. The thought of disappointing his fans is another fear that he overcomes. Aoki is deep in preparations for perhaps the biggest match of his career, to help him gain the focus and courage reclaim what he lost. Aoki is set for a highly-anticipated rematch with the Philippines’ Eduard “Landslide” Folayang for the ONE Lightweight World Title on 31 March in Tokyo. The two figure in the main event of the stacked ONE: A NEW ERA card, the first ever live ONE Championship event in Japan. With less than a month to go, Aoki is confident in giving the best performance of his career. He fully expects to emerge victorious in front of his hometown crowd.